I'm done having kids. I miss being pregnant, creating a new life within, holding that baby, swaddling, snuggling, loving and watching a baby grow into an amazing person! I'm also glad to be done. It's funny how we can feel torn in these matters. My dear friend Carie is pregnant with little Colton and I just can't wait to get my hands on the little guy!! So in celebration of her, her hubby Kevin and their newest addition I created this cute card and banner to celebrate the little one and my dear friend. Join Me in creating and sending love into this world with a hand-crafted card and gift! This family is a well dressed family! Of course their little guy will be dapper in his newest and most stylish baby duds. 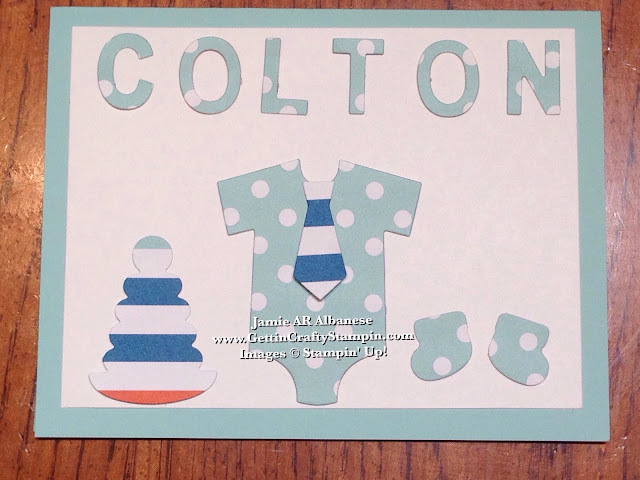 Honoring this is easy to do with our Baby's First Framelits and the new Schoolhouse Designer Series Paper. The die-cut letters from the banner, below, fit perfectly on this hand-crafted card! I love how our products coordinate and are so easy to use. A little man with a big future! Dinosaurs are all the rage and I was in awe of them in Kindergarten. 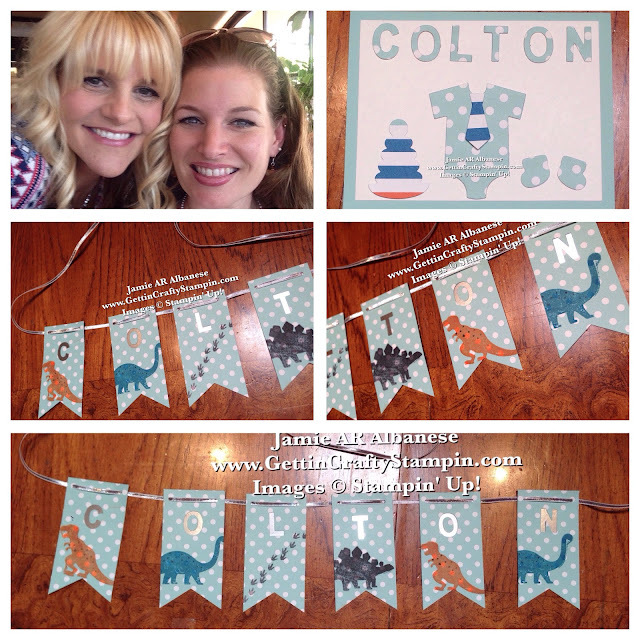 Creating this cute personalize banner is a fun way to celebrate this little guy. I love how banners remind me of the hymn 'His Banner over me is love...'. 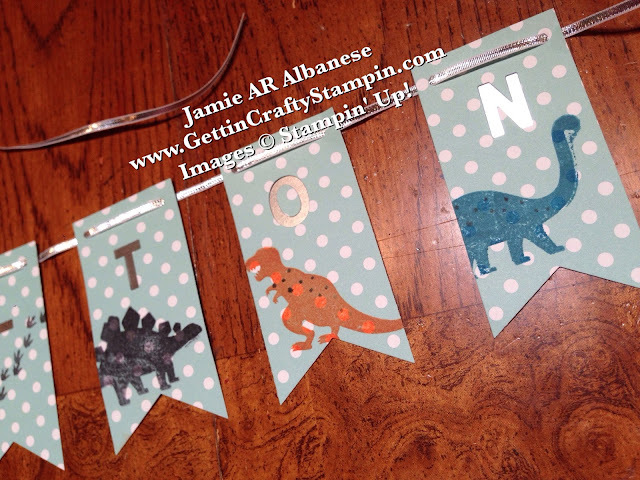 Start this banner creating a 2"x 4 piece of Designer Series Paper. 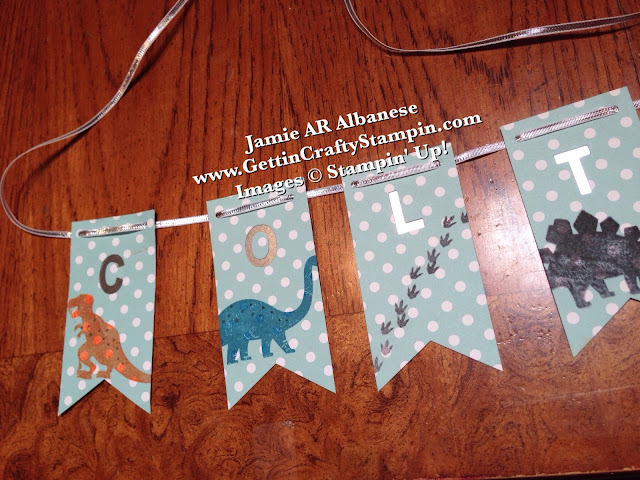 Using the new Triple Banner Punch to create this cute banner. Die cut the letters with ease using the Magnetic Platform on the Big Shot Die-Cutting Machine and the Little Letters Thinlits. Cute dinos welcome in this new little guy. He is bound to shine bright (two good looking parents really). Shine this banner up with the Silver Foil Sheets behind the die-cut letters and the Silver 1/8" Ribbon tying it all together. One little man, one stunning woman, one handsome man, four weeks to go - add it up and you get bliss! Celebrate life of others you love with a hand-crafted gift. 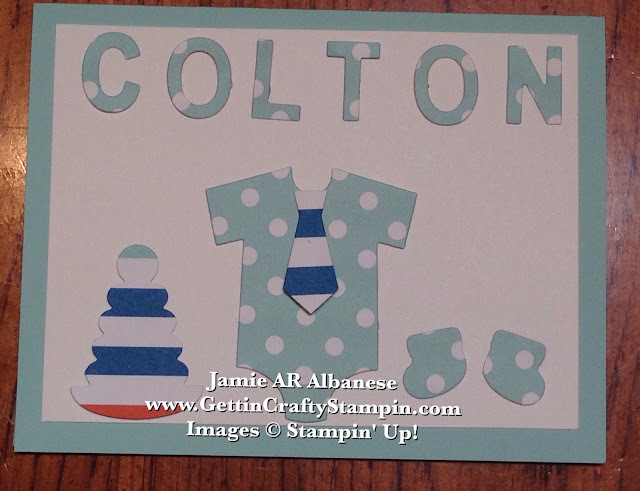 This handmade card is a fun way to be a part of this special celebration. I love Carie, she's beautiful inside and out! I'm excited for her newest adventure of this little man. From Babies to Kids to young-at-heart - a hand-stamped card is a great way to celebrate life with all.